When no distinct cause of pain can be found, it is often useful to look at the mastication system. Those affected often suffer from joint damage and functional disturbances in this area. Practical knowledge as well as studies suggest that this is no coincidence. Chewing would appear to most people to be an everyday and banal activity. “Far from it”, says Doctor of Dental Surgery Rainer Schöttl from Erlangen. “Chewing is a highly complex process in which the muscles perform a unique role in the organism. They need to bring the mandible to a precisely defined point in its range and produce a precise occlusion of the 16 tooth pairs”. As part of the reflexive interplay between chewing and neck muscles on the one hand, and “high-resolution” receptors on the other, the position of the jaws are continuously adjusted to one another. “Even the floating rest point is nothing more than a targeting in on the occlusal end position”, says Schöttl. 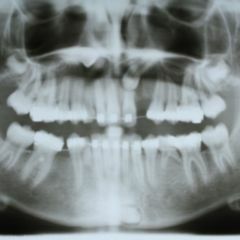 This orchestral harmony however can easily go astray – for instance with defective jaw development, injuries, joint diseases and internal disarrangement, or when for these or other reasons an ill-defined bite results. “Then the jaw position already needs to be adjusted during the rest point phase, which strains the muscles only in one particular way”, explains Schöttl. In addition, many patients develop a disturbed occlusion sensation and parafunctions, such as permanent grinding or pressing of the teeth. “While the cumulative duration of tooth contacts in healthy people is about 20 minutes per day, with these patients it is often several hours”, says Schöttl. In those instances where such findings are made, specialists speak of craniomandibular dysfunction (CMD), or temporomandibular disorder (TMD). According to studies, it is found extensively. With signs and symptoms including joint cracking, limited or asymmetric jaw opening, tenderness of the jaw or abraded teeth, in the USA prevalence rates were reported as varying between 40 and 75 percent. In the German Study of Health in Pomerania (SHIP) nearly half of the approximately 7,000 participants involved were affected. 3 to 10 percent of patients report symptoms of a clinically relevant extent. It usually involves pain and discomfort in the face, jaw, head and neck, but also tinnitus, dizziness, blurred vision and back pain have been associated with CMD. Even with fibromyalgia and chronic regional pain syndrome (CRPS) the disorder is supposed to play a role. “Such observations have been known in the field of manual medicine for some time”, says specialist for physical and rehabilitative medicine Dr. Michael J. Fischer, Munich. Study data is also available. It indicates that up to three quarters of fibromyalgia patients simultaneously have CMD – what’s more in one investigation of 20 severely ill patients with CRPS all were affected. Naturally, such epidemiological studies give no information as to whether there is behind these associations a causal relationship or whether CMD is only an accompanying phenomenon. Apart from this: Is it at all plausible that CMD triggers pain not only locally, but throughout the body? Yes indeed, say the proponents of the concept. According to their view, at the local level joint diseases or the aforementioned poorly-developed bite leads to a chronic irritation of the muscles of mastication. The consequences are tension and pain, factors which support each other in a vicious circular manner, or are even mutually reinforcing. This is where the trigeminal nerve comes into play. Pain-conducting fibres from different regions are interconnected within it. As soon as it receives nociceptive signals from the jaw area, because of this interconnection it is also perceived as a so-called referred pain elsewhere, in a form such as neck strain or headaches. Also the trigeminal nerve connects proprioceptive signals to the back muscles via projections and thus right down to the lumbosacral region. Asymmetries and temporomandibular joint pain can thus radiate far into the body. “As well as that there are findings that come from chiropractic medicine”, Fischer confirms. “We see time and again that interventions in the mastication system influence the results of the Patrick-Kubis-Test or Prien Abduction Test to a considerable degree.” In one study Fischer deals with this aspect scientifically as well. “In patients with CRPS, we have shown that relaxation of the craniomandibular muscles clearly improves the hip flexibility”, according to Fischer. Among appropriately trained dentists and orthodontists, doctors practising manipulative medicine and therapists, it is therefore mostly self-evident in cases of chronic pain to think of CMD. The diagnosis is according to Schöttl easily made on the basis of the typical clinical signs and symptoms. “One should always observe whether eyeline, the earline, the chewing line and shoulder levels are slanted. 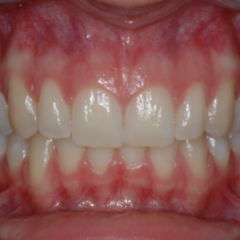 What also stands out is when the incisor middle of the upper and lower jaw is not in the vertical centre of the face. “Further evidence of CMD are a forward-shifted head posture, joint cracking and severe abrasion of the teeth”, says Schöttl. The extent to which an impaired occlusion is present can be quickly tested with the so-called Aqualiser Test. 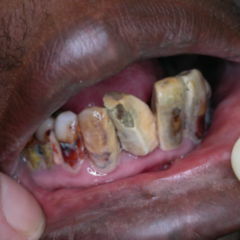 This involves use of a water pillow that the patient ideally holds overnight between the teeth. 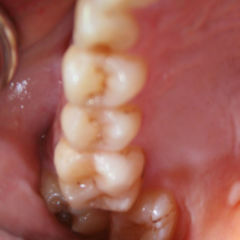 “In cases of unfavourable load and strain of the bite, patients often already notice an improvement after only a short time”, Schöttl states knowingly from experience. Imaging techniques and instrumental functional analysis can additionally support or substantiate the diagnosis. For the treatment of CMD, detonisation (ie. relaxation) measures or bite splints come primarily into consideration – depending on whether the etiology is myogenic or arthrogenic. Whether further action is necessary depends on which of the functional processes and anatomical structures are affected and whether a mental comorbidity is present. With extensive and long-term chronification, a multimodal therapy – to which doctors and therapists of various disciplines contribute – has the greatest chance of success. The fact that this is a laborious path for the patient is obvious. “However”, insists Fischer, “in manual manipulation medicine we often observed that chronic pain can hardly be treated in an ongoing manner when a concurrent CMD is not being equally addressed”. A lot of unsubstantiated chiro blather.